FORT MYERS, Fla. - Red Sox relief pitcher Bobby Jenks said yesterday that an error during his surgery at Massachusetts General Hospital resulted in his needing emergency surgery in Arizona 18 days later. The result could leave the righthander unable to pitch this season and has again raised questions about the team’s medical care. Jenks’s comments, and the possibility of a lawsuit, have put two venerable Boston institutions in an awkward position. The Red Sox want to support their player but also have a longstanding business relationship with the hospital. Jenks had spinal decompression surgery Dec. 12 that was expected to correct a back condition that led to him twice being placed on the disabled list last season. Dr. Kirkham Wood, chief of MGH’s orthopedic spine service, performed the surgery. According to Jenks, the fluid pooled at the bottom of his incision and was constantly leaking. Severe headaches followed. Jenks contacted the Red Sox, who advised him to seek immediate treatment in Phoenix. Jenks said he was rushed into surgery the day he was examined, Dec. 30. Dr. Christopher Yeung, a spine specialist, operated on Jenks, and the most severe of his symptoms soon abated. Jenks said he was in excruciating pain before the second surgery and that it was “very, very painful’’ to recover from. Dr. Mitchel B. Harris of Brigham and Women’s Hospital said last night that Wood is a highly qualified surgeon and it was unlikely he did anything to cause the complications. Jenks has a long red scar on the middle of his back, about 7 inches long. He reported to spring training but is unable even to play catch. “My muscles were so torn open, I was basically laid up in bed and couldn’t function,’’ he said. Red Sox general manager Ben Cherington said the team is investigating what happened. Jenks was asked about the possibility of legal action. Jenks’s agent, Greg Genske, did not return calls seeking comment. Said Cherington, “All I know is the second procedure needed to happen, and that’s unfortunate with any player that requires a surgery. You don’t want to have to go back in there and do anything a second time, certainly that soon thereafter. 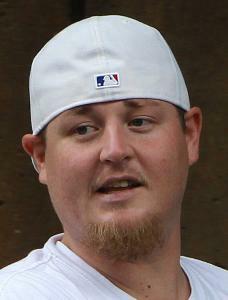 Jenks, who turns 31 next month, does not know whether he will be able to pitch this season. Signed to a two-year, $12 million deal before the 2011 season, he appeared in only 19 games last season. Jenks required medication to clear up a pulmonary embolism before he had the first surgery. “It has been incredibly frustrating,’’ he said. This is latest in what has been a series of medical missteps for the Red Sox. Center fielder Jacoby Ellsbury accused the team of incorrectly diagnosing a rib injury he suffered early in the 2010 season, something the team denied. Second baseman Dustin Pedroia broke a bone in his left foot in June of that season, returned in August, and lasted only two games before having surgery. Last year, righthander Clay Buchholz was said to have suffered a minor back injury in June that was later diagnosed by an independent specialist as being a stress fracture. Outfield prospect Ryan Kalish tore a shoulder labrum in April, was advised to try rehabilitation, and eventually required surgery that did not take place until November. The Red Sox removed Dr. Thomas Gill as their medical director after last season, replacing him with another MGH-affiliated doctor, Peter Asnis. The team also reassigned its head athletic trainer and fired three other people on the medical staff.